It’s been a year of remarkable global achievements for Shell’s Prelude project. From the installation of the first processing module in South Korea to the construction of the largest turret ever built in Dubai. Take a look at some of the extraordinary highlights from this world first project to liquefy natural gas at sea. Climbing onto the largest vessel the world has ever seen brings you into a realm where everything is on a bewilderingly vast scale and ambition knows no bounds. Four football pitches placed end-to-end would not quite match this vessel's length - and if you could lay the 301m of the Eiffel Tower alongside it, or the 443m of the Empire State Building, they wouldn't do so either. In terms of sheer volume, Prelude is mind-boggling too: if you took six of the world's largest aircraft carriers, and measured the total amount of water they displaced, that would just about be the same as with this one gigantic vessel. Soon after dawn, groups of workers - electricians, scaffolders, welders - gather for exercises and team-building before entering lifts that carry them the equivalent of ten storeys up. On board Prelude, amid a forest of cranes and pipes, it is almost impossible to get your bearings. Standing near the bow and looking back, the accommodation block that rises from the stern can just be made out in the distance. The yard, one of the largest in the world, is a mesmerising sight with around 30,000 workers toiling on the usually unseen infrastructure of the global supply of fossil fuels: dozens of drilling ships, oil storage tankers and gas transporters. Prelude is not only the largest of all of these to take shape in this hive of activity - it also pioneers a new way of getting gas from beneath the ocean floor to the consumers willing to pay for it. Until now, gas collected from offshore wells has had to be piped to land to be processed and then liquefied ready for export. Usually, this means building a huge facility onshore which can purify the gas and then chill it so that it becomes a liquid - what's known as liquefied natural gas or LNG - making it 600 times smaller in volume and therefore far easier to transport by ship. And LNG is in hot demand - especially in Asia, with China and Japan among the energy-hungry markets. In Shell's view, this means avoiding the costly tasks of building a pipeline to the Australian coast and of constructing an LNG facility that might face a long series of planning battles, and require a host of new infrastructure on a remote coastline. The computer animations make it look easy. In practice, the engineering challenge is immense. To speed up construction, the key elements of the processing system are being assembled on land before being installed on the vessel. During our visit, we witnessed the extraordinary sight of a 5,500-tonne module being winched into position on the deck. 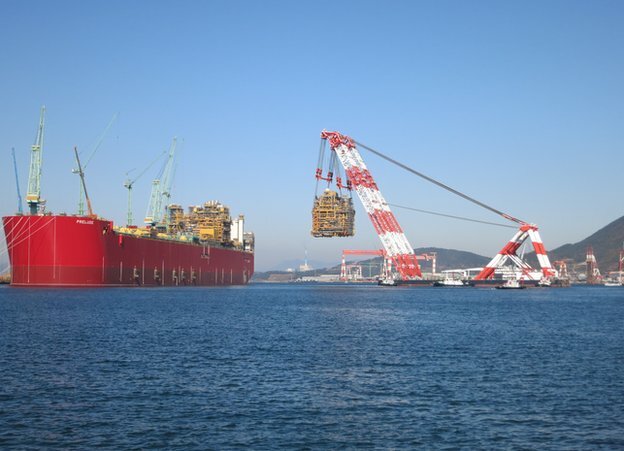 Like a massive jigsaw piece, it was a tight fit - given that Shell is planning to squeeze the LNG plant into one quarter of the space you would expect on land. This was the third of 14 modules. The installation took less than a day and was successfully completed but there's clearly a lot of work still to do, which is why Shell officials are coy about committing to a date for when Prelude will actually start work. It looks like being several years at least. Cris Moreno has a big job on his hands. His task is to make sure Shell's Prelude FLNG project can transfer its liquid cargo in one of the loneliest places on the planet; 200km's off the north-west coast of Australia. It took thousands of hours to develop the technology needed to deliver the challenge, but Cris is finally ready to test these 'arms of innovation' for the first time. The Shell pitch is that gas, as the cleanest of the fossil fuels, is set to become more important in the coming decades as a far more climate-friendly alternative to coal. And as China tries to clean up its polluted air, largely caused by coal-burning power stations, as I reported in January, switching to gas would surely make a difference. Only up to a point, however: the gas-is-cleaner argument only works if the new supplies of gas actually replace coal rather than become an additional source of fuel. And the UN's Intergovernmental Panel on Climate Change concludes that while gas would be a welcome "bridge" between coal and low-carbon energy for the next 20 years or so, in the long term it will need to be phased out, like all fossil fuels, unless a way is found to capture the carbon dioxide that burning it releases. Shell is banking on gas being in such demand that prices will remain high enough to justify Prelude's cost - which has not been stated but must run into billions. The gas price might collapse, if China's economy dips, or Japan restarts its nuclear power stations, closed since the Fukushima disaster, and suddenly needs less gas. As our lift brings us back down to the quayside, the winter sun bathes the dockyard in golden light and convoys of buses ferry the multitude of workers home. During the night, specialist teams will check for the strength of the welds and the quality of the work. A project of this kind has never been tried before and, like all firsts, Prelude is something of a gamble. An ADMIRALTY H-Note App is now available for Android™ devices and iPhone, iPad and iPod touch. This App is aimed at mariners wishing to send hydrographic data to the UKHO via a mobile device. The ADMIRALTY H-Note App presents a quick and simple new way to report new or suspected dangers to navigation or changes observed in aids to navigation. The application takes advantage of the mobile device's built-in camera and GPS to help gather important navigational information and to e-mail it to the UKHO using the device's e-mail software once the vessel is in a WiFi or cellular coverage area. When you submit an H-Note via the App, you will receive an acknowledgement and the information will be used by the UKHO to take immediate action or to consider using the information in the next appropriate revision of a chart or publication. The H-Note App is available for both Android devices and iPhone, iPad and iPod touch. keeps a record of all your H-Notes. Please visit the UKHO website for more information on H-Notes and Maritime Safety. which SpaceX calls an "autonomous spaceport drone ship"
SpaceX aims to propel modern rocket science into a brave new era Tuesday by landing a key part of its Falcon 9 rocket on a floating platform in the Atlantic Ocean. Billionaire Internet entrepreneur Elon Musk, who heads the California-based company, said on Reddit late Monday he has "no idea" if the attempt will work, after previously giving the bid a 50-50 chance of success. "I pretty much made that up. I have no idea :)" he wrote in an "Ask Me Anything" session. The experiment involves the first-ever attempt at guiding the powerful first stage of the rocket to landing spot about 200 miles (322 kilometers) off the coast of northern Florida after launching from Cape Canaveral at 6:20 am (1120 GMT). SpaceX hopes the effort will transform the rocket industry from one that creates parts worth millions of dollars that are left to fall into the ocean after blastoff, to one that reuses its assets much the way commercial airlines fly the same planes again and again. "A fully and rapidly reusable rocket -- which has never been done before -- is the pivotal breakthrough needed to substantially reduce the cost of space access," said a company statement. The attempt will come after the Falcon 9 launches from NASA pad early Tuesday, carrying the unmanned Dragon cargo vessel which is packed with supplies and equipment for the six astronauts living at the International Space Station. The rocket will separate, as it usually does, allowing the second stage to continue propelling the spaceship to orbit. But this time, SpaceX will relight the engines on the 14-story tall Falcon 9 first stage. Then, three separate engine burns should guide and slow the rocket down so it can land upright on the 300 by 100 foot (91 by 30 meter) platform, which SpaceX is calling an "autonomous spaceport drone ship." Extra fins have been added to the rocket to help it maneuver. "The grid fins are super important for landing with precision," Musk wrote on Reddit. "The aerodynamic forces are way too strong for the nitrogen thrusters. In particular, achieving pitch trim is hopeless. Our atmosphere is like molasses at Mach 4!" Video of Falcon 9 Reusable (F9R) during a 1000m test flight at our rocket development facility in McGregor, TX. This flight was our first test of a set of steerable fins that provide control of the rocket during the fly back portion of return. The fins deploy approximately a minute and 15 seconds into the flight, and return to their original position just prior to landing. The company has already shown in two tests that it could execute some control over the return the first stage of the Falcon 9, slowing it down to a hover before allowing it to splash into the ocean. 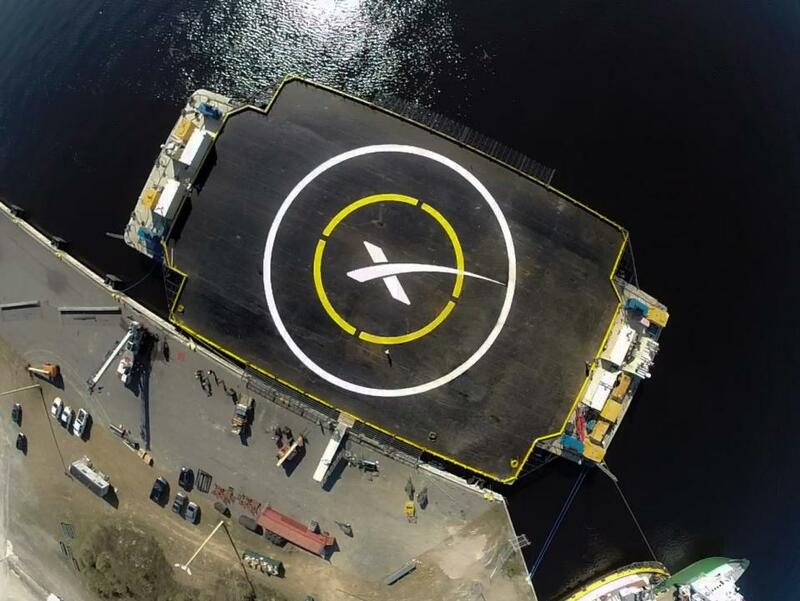 This time, no personnel will be within a distance of about 10 miles from the landing platform, said Hans Koenigsmann, vice president for Mission Assurance at SpaceX. He also said that real-time updates are not likely even though there are cameras on the rocket to capture the experimental landing. 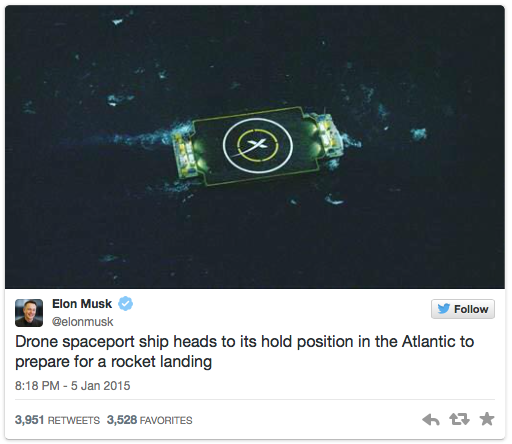 "It is very difficult to hit a platform of that size," he said at a NASA briefing on Monday. "If you look at it from almost 150 miles up in suborbit, it looks like a very small place to land on." SpaceX had described the challenge as going from a landing accuracy of 10 kilometers in past tests to 10 meters in this attempt. In the final moments, gravity should help the rocket set itself down on the platform. "The center of gravity is pretty low for the booster, as all the engines and residual propellant is at the bottom," Musk wrote. Following the successful launch of six ORBCOMM satellites, the Falcon 9 rocket’s first stage reentered Earth’s atmosphere and soft landed in the Atlantic Ocean. This footage is from a chase plane filming the decent of the first stage back to earth. The launch was initially supposed to take place last month. But SpaceX postponed it on December 18 after a launchpad static test fire was a "tad short" and the team decided to exercise caution and postpone until the New Year, Koenigsmann said. If the company's fifth contracted launch with NASA to the ISS goes ahead as planned Tuesday -- and weather is 70-percent favorable for launch -- the Dragon cargo ship should arrive at the ISS on January 8. The supply ship is carrying its heaviest load yet -- 1.8 pressurized metric tons of "much-needed cargo," said ISS program manager Mike Suffredini. "The SpaceX folks have used quite a bit of ingenuity to help us put items in all the little cracks and crevices as we kind of lean on the Dragon vehicle to supply ISS here for the next little while until the Orbital folks are flying again," he told reporters. SpaceX has a $1.6 billion contract with NASA for 12 missions to supply the space station and return cargo to Earth. Orbital Sciences also has a $1.9 billion contract with NASA to supply the space station. However, an engine failure on Orbital's Antares rocket in October cost the company $200 million in lost parts and postponed its remaining launches until further notice. "When battle looms, UUVs could push the fleet's defensive frontier outward, holding surface and subsurface threats at bay while working with other sensors to apprise commanders of what's transpiring in their environs." What's an unmanned underwater vehicle (UUV) good for? A lot—if the technology fulfills its hype. 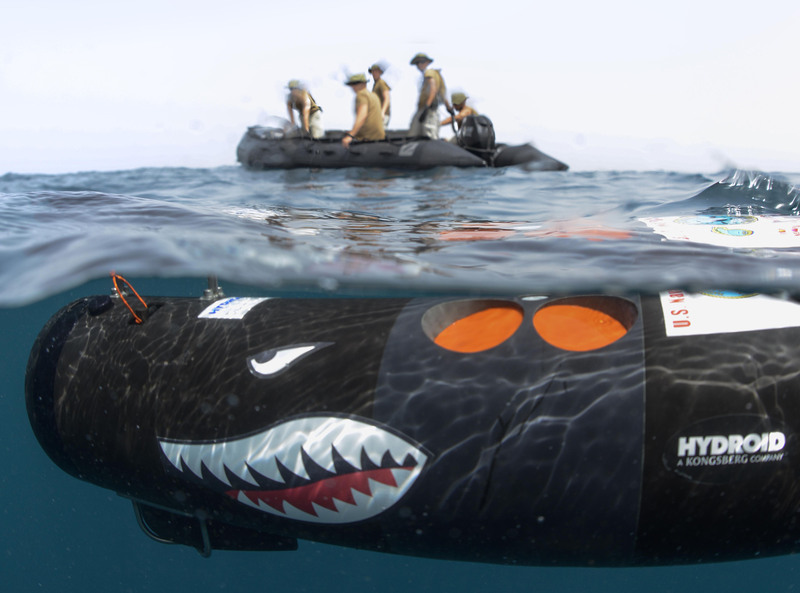 In that sense the UUV inhabits the same limbo as shipboard unmanned aerial vehicles (UAVs). UAVs have proved they can operate from aircraft-carrier flight decks, but the U.S. Navy appears conflicted about whether they should be mainly surveillance or mainly strike aircraft. UAVs clearly have a place in the carrier air wing, but time, technological progress, and cost will determine what it is. In turn tactics, operations, and strategy must obey the limits of the possible. A fair amount of ink has been spilled over the years elucidating the technical dimensions of UUV projects. Rather than retread old ground, let's situate UUVs in their operational and strategic context. If things do work out, remote-controlled or autonomous UUVs could amplify the U.S. Navy's effectiveness throughout the slate of missions entrusted to that fighting force. Surface vessels could deploy UUVs for reconnaissance or combat duty. Indeed, the U.S. Navy's littoral combat ships rely on embarked helicopters and UUVs for anti-submarine and counter-mine missions. Attack submarines, moreover, can carry UUVs sized for launch through their torpedo tubes. Larger, more capable vehicles boasting their own armament are also in the works as an adjunct to the silent service. To glimpse the import of this newfangled gadgetry, look at the map. To police the maritime commons, in peacetime and wartime alike, a navy needs sufficient assets and firepower on station at the right places and times. A regional power—even a China or India—has the luxury of concentrating its resources in discrete parts of the commons. Beijing cares mainly about the China seas, New Delhi mainly about the Indian Ocean. That simplifies problems for Chinese and Indian seafarers. But if you're the U.S. Navy and your operating theater is the world, police or warfighting duty demands not just serious combat capability but ships and aircraft in large numbers. When budgets are fixed, shipbuilding costs are spiraling upward, and fleet totals are stagnant, commanders and their political masters naturally cast about for lower-cost substitutes for pricey hulls and airframes. It's an open question whether the navy can afford the modest boost in fleet totals the sea-service leadership envisions. For instance, the attack-submarine inventory may fall to as few as 41 boats over the coming years as the navy strains to fund replacements for its aging Ohio-class ballistic-missile subs. Fewer SSNs, less geographic coverage. Hence service chieftains' search for UUVs and carrier-borne UAVs. 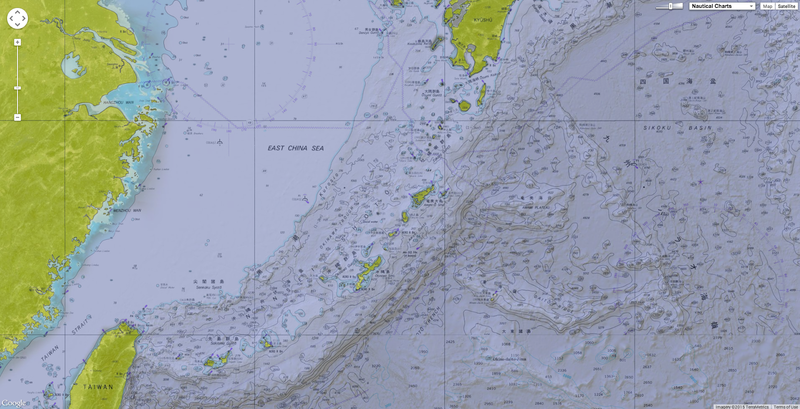 Geography, then, stands aback of the mania for new undersea capabilities. But it's not just the sheer volume of water to be overseen, is it? It's also about working within the fixed setting imposed by nautical terrain. 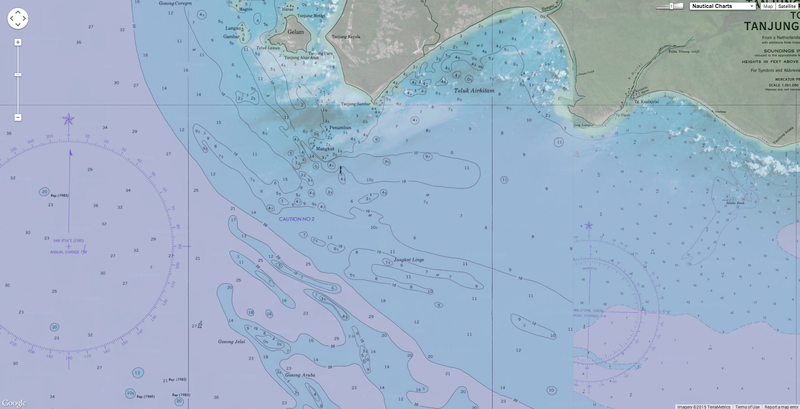 Where can mariners find enemies plying the waves, or otherwise monitor and regulate the flow of shipping? No navy, no matter how well equipped with gee-whiz hardware, is all-seeing. 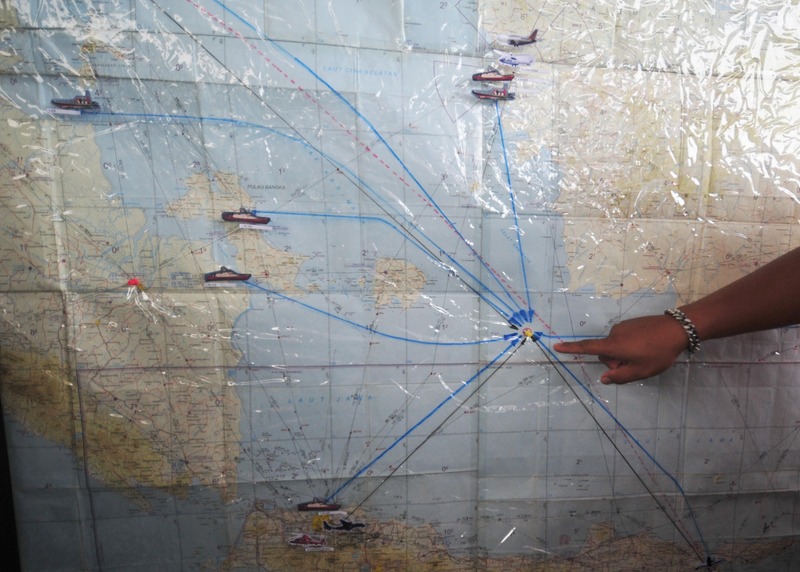 Now as throughout history, the best places to find a ship are at its port of origin, at its destination, if known, or at focal points such as straits where shipping must converge to pass from point A to point B. In Northeast Asia, for instance, passages piercing the Ryukyus island chain funnel east-west passage between the East China Sea and Western Pacific into narrow pathways. 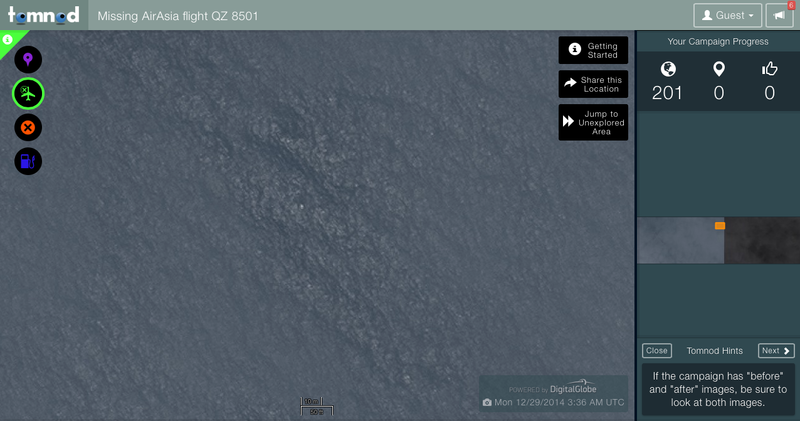 Such pathways are easily monitored—and perhaps interdicted—relative to seeking out adversaries on the open ocean. 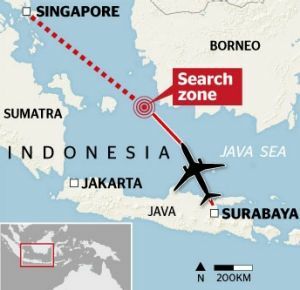 The Malay Peninsula and Indonesian archipelago, similarly, corral shipping transiting between the South China Sea and the vast Indian Ocean into cramped shipping lanes. Stationing UUVs at such geographic nodes would amplify the American presence, improving watchfulness for a fleet too small to be everywhere all the time. Such sentinels—especially if technology permits arming them for distant operations—will bolster the prospects for success in such missions as fleet actions, sea denial, blockades, and otherwise controlling major sea routes. A century ago historian Sir Julian S. Corbett catalogued the basic functions navies perform. For Corbett a navy exists to dispute a stronger opponent's command of the sea, wrest away command for itself, and exploit command once it's in hand. That's not a bad way to project the contributions UUVs could make, and to measure success as they join the fleet. produced by the pentagon channel. For instance, submarines remain the sea-denial platform par excellence. They can penetrate and wreak havoc in enemy-dominated waters while the U.S. and allied surface fleets try to assemble combat power sufficient to win command. UUVs can act as the eyes of the undersea fleet and, over time, could extend attack boats' combat reach beyond the very modest range of their torpedoes. When battle looms, UUVs could push the fleet's defensive frontier outward, holding surface and subsurface threats at bay while working with other sensors to apprise commanders of what's transpiring in their environs. Acting as a fleet skirmisher, safeguarding the underwater flank, and helping complete the operational picture is no small accomplishment. And once the American and allied navies gain control of contested waters, UUVs will still have their part to play. Winning command of the sea confers the prerogative to control shipping, blockade enemy shores, land troops, and on and on. Littoral combat ships, for example, would likely be assigned to deploy their UUVs to clear minefields before amphibious transports moved inshore to land marines or soldiers. Keeping watch over nautical focal points would help the navy enforce maritime quarantines while preventing an enemy from mounting new high-seas threats. UUVs, in short, could become the new workhorses of the fleet. So my metrics for judging the progress of UUV operations will be technical adequacy and Sir Julian's geographically informed guide to maritime strategy. Are unmanned underwater vehicles a cure-all for everything that ails a cash-strapped navy? But their potential is worth tapping to the max.